By request we’ll be continuing our Back Office Series. The last couple of weeks we’ve reviewed some time-task management tools, filing, backups and spreadsheets. Getting Started Costs: Purchase price based on various financing options, closing costs, Phase 1 remodel budget estimate. Renting and leasing: Expected rent proceeds. Vacancy, and maintenance, taxes and insurance costs. Loan payments and property management fees (if any). Net rent return. Return on Investment (ROI): Total investment costs and returns based on various financing options.. 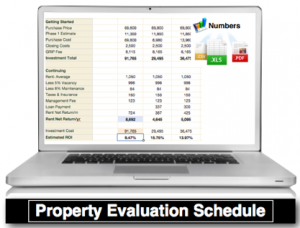 If anyone has a property they would like us to evaluate or other question let me know. We’ll either do some live (will need to answers most of the PES questions – click here to view or download sample) or create one from a past inspection. Microsoft Excel or Mac Numbers. This entry was posted on Wednesday, June 20th, 2012 at 5:07 pm and is filed under Investors Webinars, Real Estate Tips, Renovators Webinars. You can follow any responses to this entry through the RSS 2.0 feed. Both comments and pings are currently closed.